Temporomandibular Joint Syndrome (TMJ) affects millions of Americans every year. In fact, it’s estimated that there are more than three million cases annually. Despite being so common, there are a lot of misunderstandings about what TMJ is, its symptoms, and how to treat it. That is where Smiles NY comes to the rescue. We’re New York City TMJ experts and have been helping people with it for decades. We decided to pool our knowledge and create this guide to everything you need to know about TMJ. Keep reading to learn what TMJ is, common symptoms, and effective treatments. Don’t hesitate to contact us today if you have any specific questions or need a consultation. Temporomandibular Joint Syndrome affects the joint that connects your jaw to your skull at the back of the cheekbone. You can think of it as the hinge that keeps your jaw connected to your skull. Someone suffering from TMJ has a damaged and oftentimes painful temporomandibular joint. It’s worth pointing out that human beings have two temporomandibular joints, one on each side of their jaw. TMJ sufferers often have pain in only one side, though they can experience pain and soreness in both sides. TMJ falls under the large umbrella of temporomandibular disorders (TMD). All TMJ issues are also considered TMDs, but not all TMDs are TMJ. Don’t worry if that is a bit confusing. It’s enough to know that TMJ is part of a larger family of disorders with common causes, symptoms, and treatments. 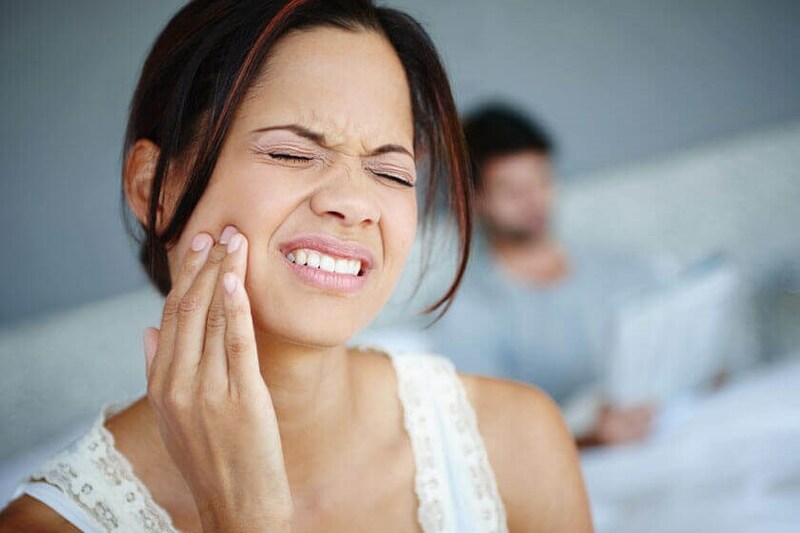 There are various causes of TMJ, including genetic factors, various types of arthritis, various injuries to the jaw and teeth, grinding and clenching the teeth, dislocating the disc between temporomandibular joint and skull, and even stress. TMJ is painful. Those who suffer from it report feeling tightness and sharp pain in their jaws and across their entire face. TMJ can also produce headaches, including migraines and cluster headaches. The good news is that this pain is temporary and will go away once you’ve properly treated your TMJ. Likewise for any associated headaches. It’s important to note that there is an almost unlimited number of TMJ symptoms and that many symptoms mimic other illnesses or disease. This makes diagnosing TMJ difficult and can also lead to misdiagnoses. It’s important that you go to a dental or medical professional to be properly diagnosed and treated for TMJ. Now that we have an idea of what TMJ is and some of its more common symptoms, let’s turn our attention to how to treat it. There are various treatments and therapies for TMJ. Some of these require medical attention and some you can perform at home. We highly recommend that you seek professional medical or dental help when dealing with TMJ! While it may be tempting to simply take ibuprofen and drink tea to help soothe your jaw, this isn’t a long-term solution. One of the most common forms of TMJ treatment is a custom-made dental appliance. Sometimes called oral appliances, these are similar to the mouth guards that athletes wear and can help improve TMJ symptoms tremendously. Dental appliances are also convenient and non-invasive, which makes them an excellent treatment option. Physical therapy is another common treatment for TMJ. This can include jaw, mouth, and face exercises. It can also include using hot and cold compresses to relieve pain and stiffness in the temporomandibular joint. Your physical therapist will create a customized plan of action for you depending on your specific symptoms. Another treatment option involves injections, which may provide pain and symptom relief for TMJ. These include steroidal injections and even Botox injections. Much like choosing surgery, it’s important to consult your dental or medical professional before taking this approach. Finally, there are a variety of TMJ-related surgeries. These include arthrotomy (open joint surgery), arthroscopy, modified condylotomy, arthrocentesis, and other procedures. Surgery for TMJ isn’t usually necessary, and should only be considered if other treatments and therapies haven’t worked to relieve your TMJ. It’s important to weigh the risk and benefits of TMJ surgery the same as you would for any other type of procedure.